Happy belated Pi Day! It was an exciting one this year (one in a hundred). We got to experience 3/14/15 9:26:53! I realize this is a nerdy thing to be excited about, but how could you not be excited when you get to celebrate with PIE! 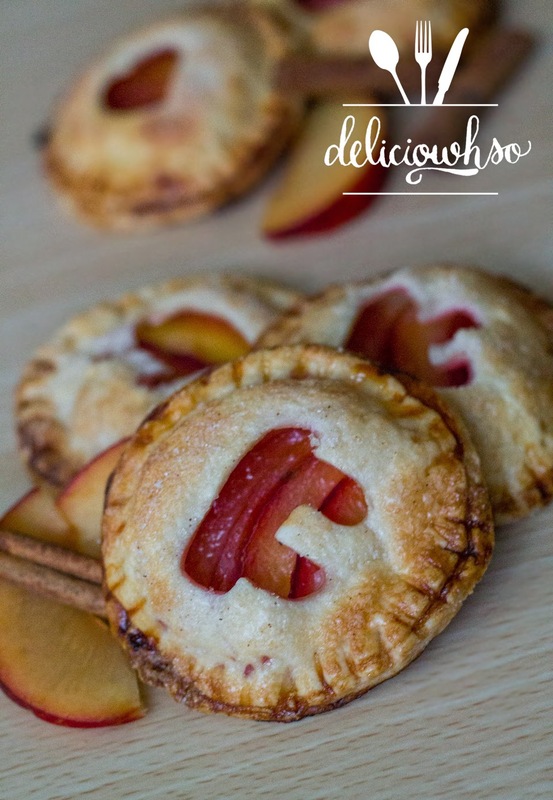 This week, I made some mini hand pies. A hand pie is basically a small handheld pocket made with pie dough and filling. Plums are starting to get closer to coming into season. You can find some popping up at grocery stores, though they'll probably be underripe. These plums are great for baking! The hard plum becomes soft when baking, without becoming soggy or releasing too much liquid. The flavor of the plums after being baked is sweet and tangy, and the texture is tender, without becoming mushy. It compliments the flaky pie dough very well.The pastry cream is a quick addition that adds a balance and sweetness to the savory pie crust. Cinnamon-ginger sugar is the perfect note of warmth to finish the pie. 6. Immediately pour the mixture into a bowl or onto a plastic lined sheet and cover with plastic touching the custard. 7. Place into the refrigerator until completely cool. 1. Preheat the oven to 350 degrees F. Slice plum into thin slices. You do this by cutting in half and removing the pit. Then, cut slices no more than 1/4 inch thick. 2. Roll the pie dough until very thin- no more than 1/8 inch. Be sure to flour your surface often, to prevent sticking. 3. Use a round cookie cutter to cut 3-inch circles. Remember you will need 2 circles for each pie. 4. You can re-roll your dough once, but then will have to rest the dough again. 5. Whisk an egg with a little water to make a quick egg wash.
6. On a baking sheet lined with foil, set half of the pie dough circles about 3 inches apart. Put the other half of the pie dough into the fridge to cool. 7. Brush the circles with a light coating of egg wash.
8. Use a spoon to spread a thin layer of pastry cream on the center of the dough disk. 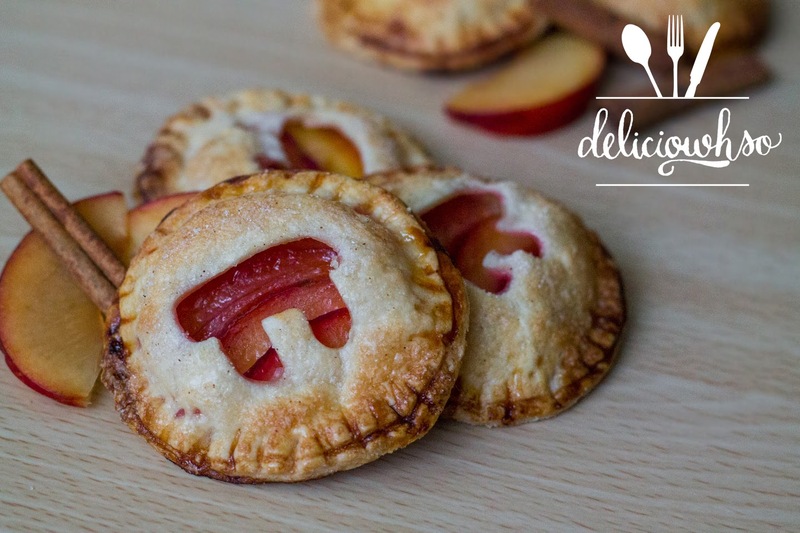 Place some plum slices onto the center. 9. Mix sugar with a little ginger and cinnamon to taste. Sprinkle the sugar onto the plums. 10. Remove the other half of the dough from the fridge and use a sharp knife to cut out a pattern. This is a vent hole to allow the steam to escape. 11. Place the top circle onto the other dough disk and use a fork to seal all the way around. You do this by pressing the fork onto the edges. 12. Brush a light coat of egg wash over the top and sprinkle with the sugar mixture. 13. Bake the plum hand pies in the oven for about 20 minutes, or until golden brown. Rotate the pan halfway through baking. 14. Allow the pies to cool slightly and serve warm.